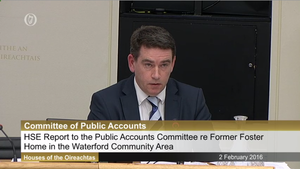 The director general of the HSE Tony O’Brien is appearing this afternoon before the Public Accounts Committee in relation to the abusive foster home in Waterford. Earlier Fine Gael’s Waterford TD John Deasy repeatedly asked him if people who were involved in the foster home are still working in the HSE. Mr Deasy also asked him what, if any, disciplinary action has been taken against those people. 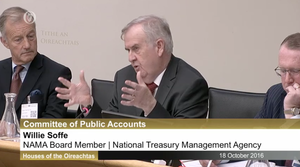 Mr O’Brien repeatedly stated that he was hampered in answering questions at PAC because of a request by An Garda Síochána not to go into the detail of two reports on the home. John Deasy: “Cut to the chase here. Outside of Garda investigations, outside of Commissions of Investigations, there are people still in the system, whom by that I mean the HSE, who have graduated to other organisations dealing with child protection. And their work and their involvement in this, in some cases, goes back to the 1990s. They’re still in the system and they’re still dealing with children, making very serious decisions at a very senior level when it comes to children. What are you doing about that? What are you doing…no, I actually want you to answer this, considering you’re the Director General of the organisation. What are you doing? You must have concerns that if there are people in there who are responsible for this, for the neglect, as you put it, the poor care, the failings, I mean surely the most basic and obvious step would be to have those people step aside until any investigation is concluded. Because the public interest dimension of this now requires, in my opinion, those people to step aside while an investigation is concluded. 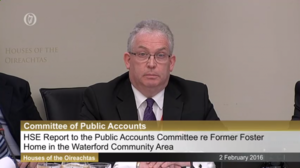 Posted in Misc and tagged Foster care home, Public Accounts Committee, Tony O'Brien, Waterford at 2:02 pm on February 2, 2016 by Broadsheet. Tony o Brien has always seemed to be a decent man and ive never found him to be evasive . Paedos are drawn to vunerable people like wasps to honey. 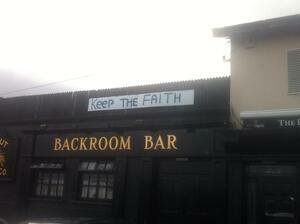 If they abused in Waterford they HAVE NOT GONE AWAY.